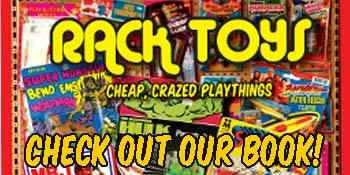 In an effort to combat the end of summer blues, I've dig deep to the days of Pegboard and regional toy stores to bring the 16th edition of our vintage toy stores feature. Installment 16 features old favorites such as the Bionic Woman and Six Million Dollar Man, Barbie, the Osmonds, Atari, Fisher Price, Mego Diana Ross and much more. We explore such long forgotten chains such as Bambergers, Two Guys as well as local toy emporiums such as The Toy Shoppes and Youngtown. 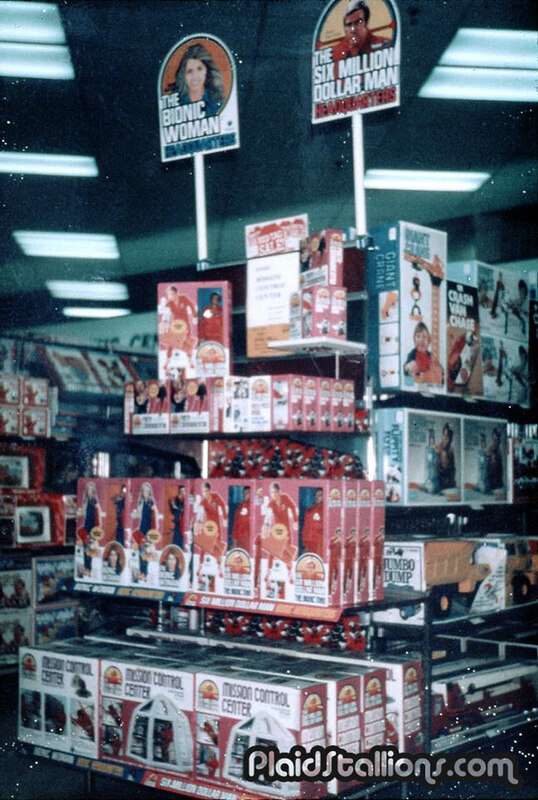 Check out Vintage Toy Store Photos Volume 16 here. 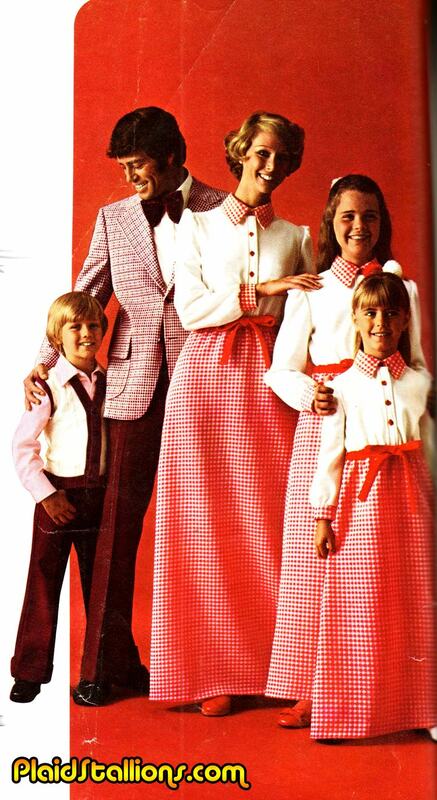 For that rare time when ruffles aren't appropriate, if that's possible. 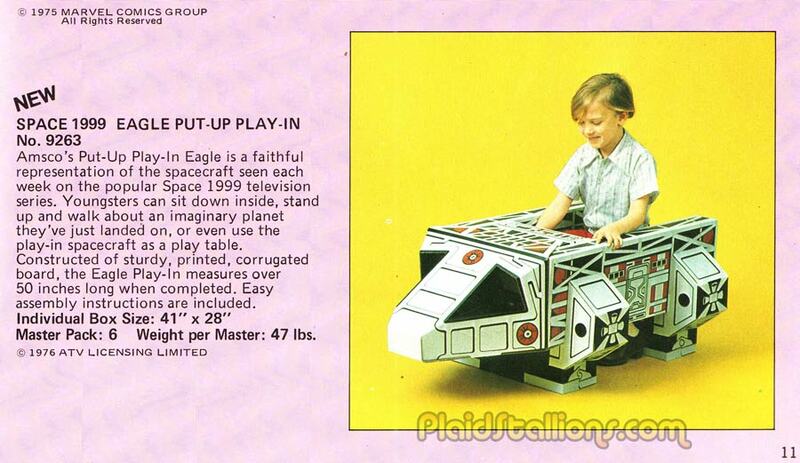 This is one of the coolest things I've shown in a while, a kid sized Eagle one. Also, unlike a lot of the stuff I show here, this actually got made! This is my third pass (you can read parts one and two here) at Dune coloring books or as I like to call them, "Comedy Gold" . The book promises you can "relive all excitement and adventure from the movie" but as we all know, crosswords and poorly thought out games rarely do that, even with good subject matter. This is in no way a poke at the quality of the film but more of a comment on the weird belief it was somehow marketable to children. 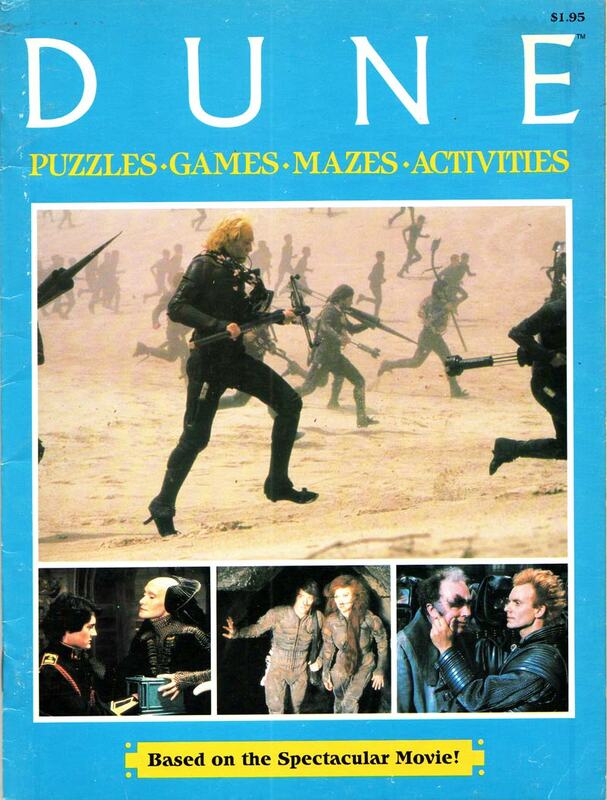 Dune is a dark, often gory ride with a narrative that would confuse a lot of kids. Yet, licensing people sold it as the next Star Wars and here we are. The other reason I keep returning to Arakis (see what I did there?) is the hope I find a colouring book page of Sting in his metal underwear, I WILL FIND YOU! The 1979 Disney sci fi spectacular "The Black Hole" didn't quite become the next Star Wars but the film did make an impression on a lot of us until the Empire Strikes back made us forget all about it. 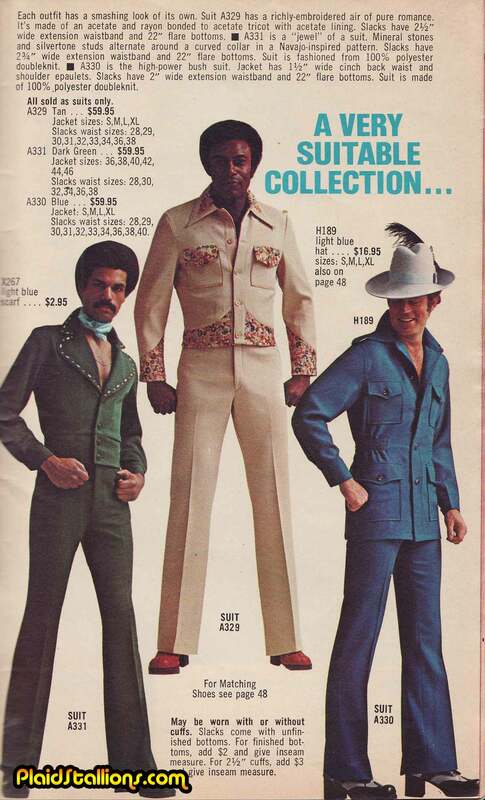 The merchandising bonanza lead by Mego was particularly memorable. In the UK, the brand was handled by Louis Marx and they added some interesting items that sadly I don't think made it to market. This one will always make me weep. 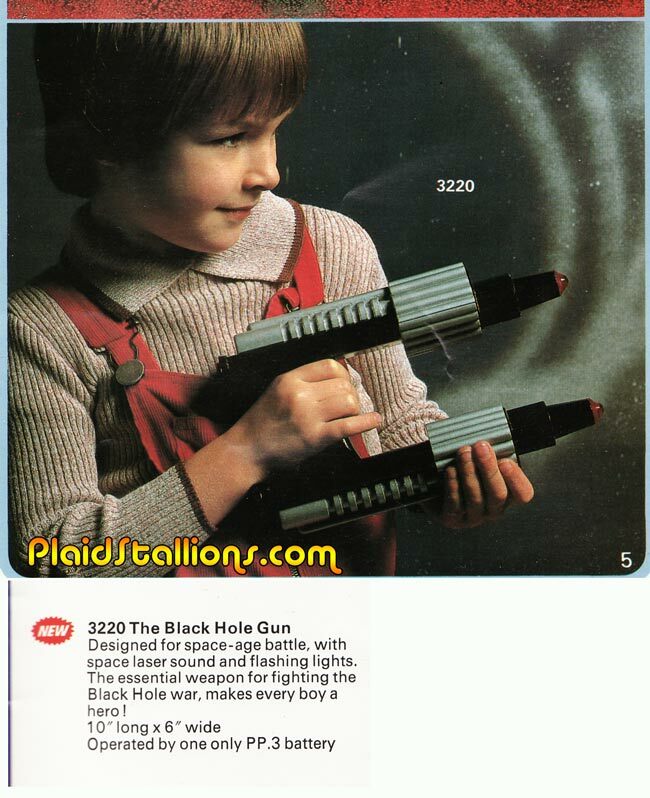 Check out the other never made toys I want in the 1980 Marx Black Hole Catalog. Because bell sleeves are perfect for every occasion. 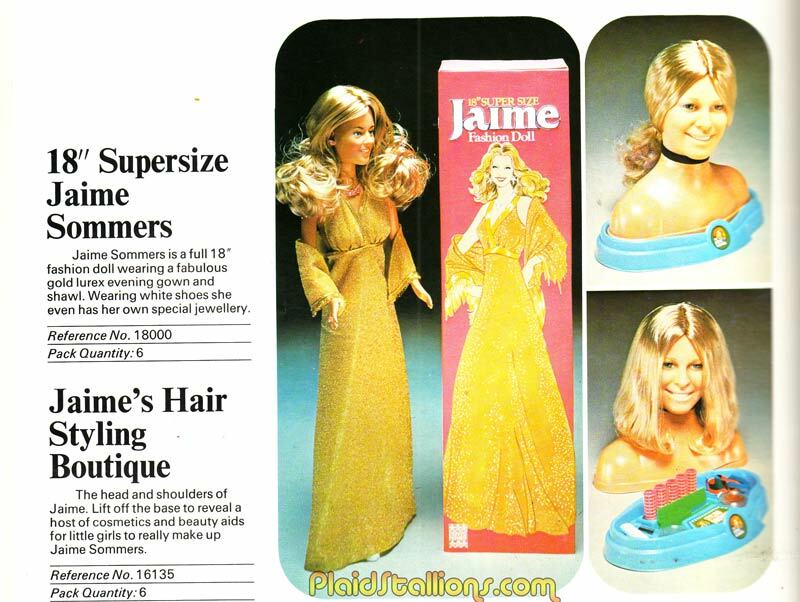 In 1977, the British Distributor of Kenner toys Denys Fisher, produced an 18" tall version of Jaime Sommers and marketed more like a fashion doll. Pity they didn't do a Steve as well. These little foreign variants are what drew me into toy collecting in the first place, I loved discovering what's out there and what i missed as kid, so to speak. Even though my collection is "Bionic Woman Free" for the most part, I can really dig and appreciate cool grail pieces like this. 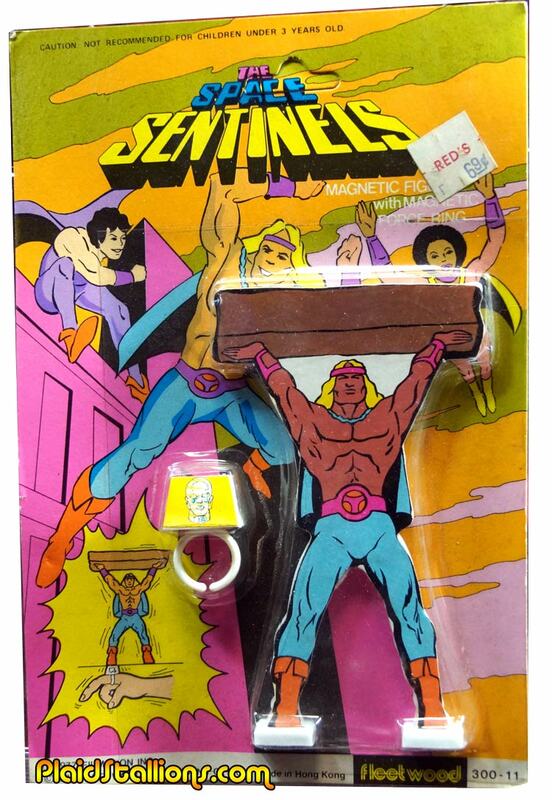 I am overjoyed to find this, a Hercules Magnetic figure from Space Sentinels. Years ago I found an Astrea, so this is a pretty big deal. Also, Herc was on my beloved "Tarzan and the Super 7", so this is win/win for me. Another colouring book I found rummaging through Planet of the Stuff a couple of weeks ago. 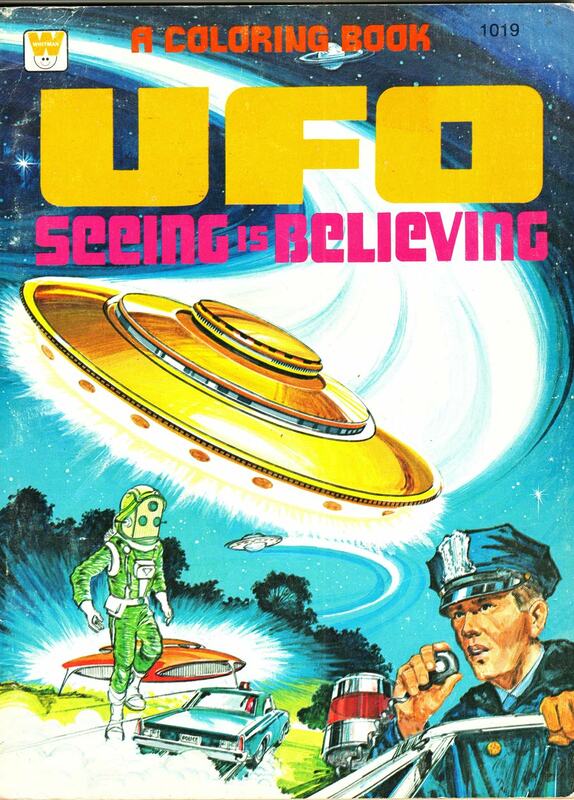 Not to be confused with the Gerry Anderson UFO coloring book we covered a few months back. Whitman had quite the little cottage industry capitalizing on the UFO craze in the late 60s/early 70s. A quick scan of Ebay reveals comics and puzzles bearing that beautiful art like this cover. I'm assuming this book is made up of abridged comic stories, the majority of them don't make a lot of sense, due to the format. I haven't done a spotlight review since the winter, mostly because honestly, I don't buy that many new things these days and people rarely send me review stuff. Lucky for me, something crossed my path I just couldn't avoid. Ever since my (largely irresponsible) older cousin let me watch Phantom of the Paradise at the tender age of 7, I've been a devoted fan of this wicked rock and roll horror satire. Heck, as I type this I'm wearing a Phantom T Shirt (which was unintentional) and I often use a Death Records lighter, I'm hooked I tells ya! This spotlight isn't about the film itself, if you're reading this I'm assuming you dig the film or are just very bored. 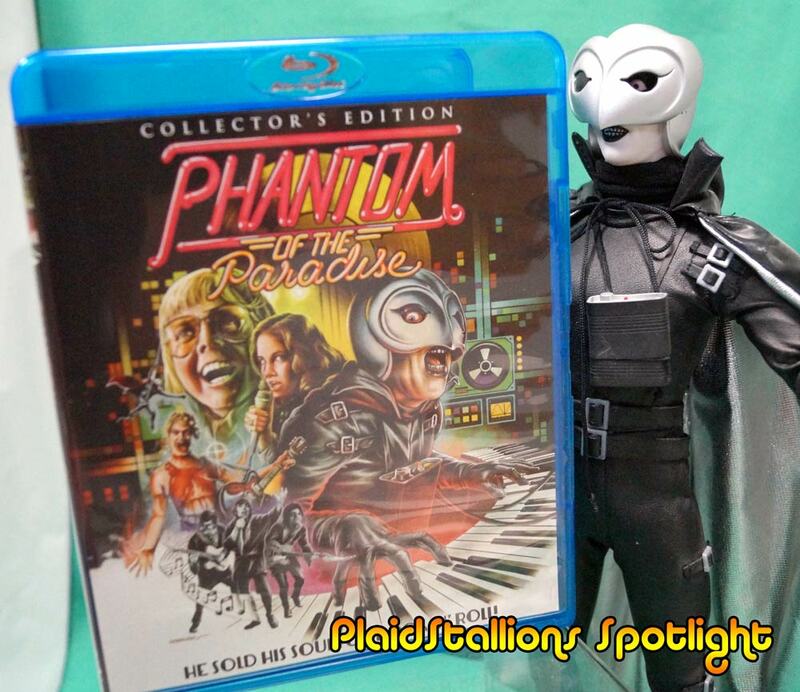 Since that initial viewing I've owned Phantom in every format possible, VHS, laser disk and the rather bare bones (and run of the mill) DVD format but when this was announced I couldn't get my wallet out fast enough. Scream Factory really went all out with the love on this one, the film on Blu Ray is a total joy, I found myself noticing things I'd never seen before and I've seen this movie a bunch people. Interviews with Brian De Palma, Paul Williams and several key production people. 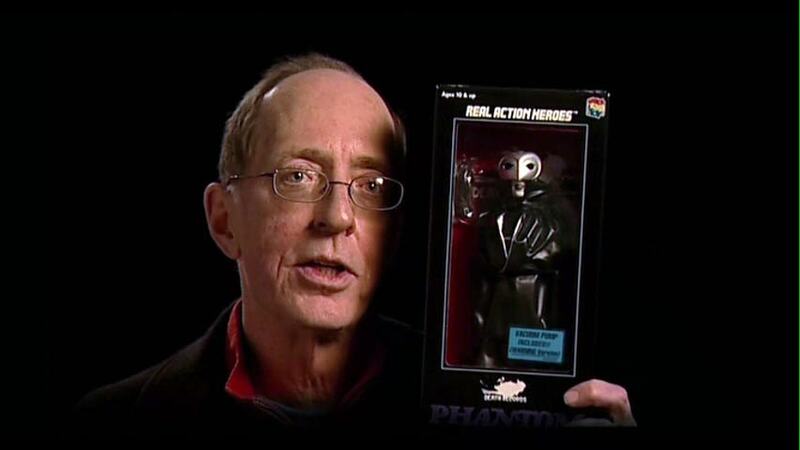 Perhaps my favourite tidbit was this little short of the late William Finley hawking his Medicom action figure. The only word of caution I would give is, this is not a DVD combo pack, you do not get the movie on DVD here. 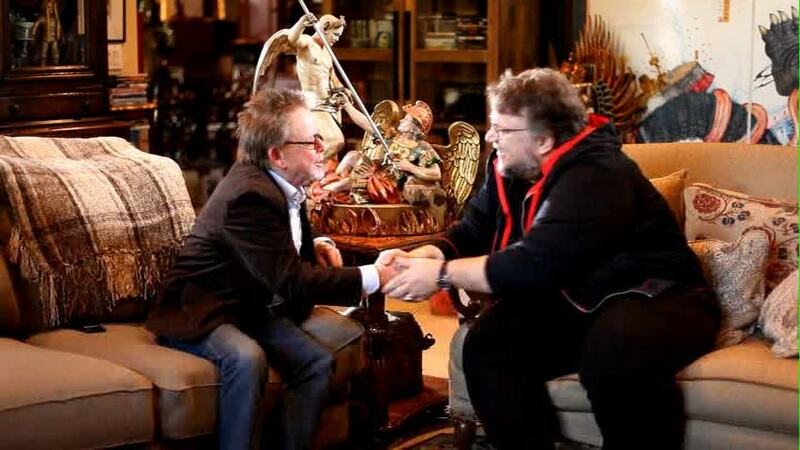 The DVD is just extras, so please don't expect to get two versions of the film itself. Otherwise, if you're a fan like me, this is an early Christmas present. I cannot recommend this enough, I honestly feel like I'm being rewarded by the cosmos for this one. Thanks Scream Factory! 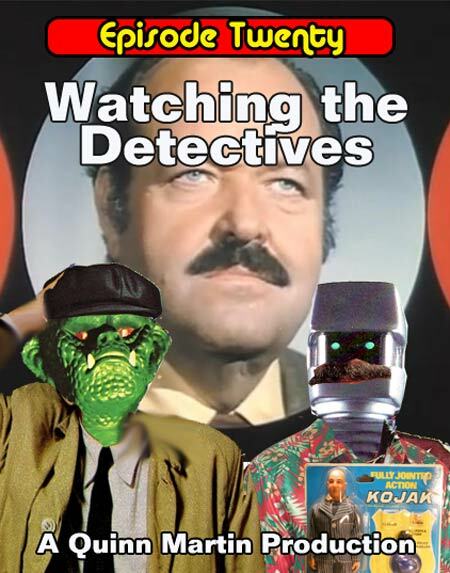 Episode 20 is inexplicably a Quinn Martin Production and has us exploring the phenom of 70s detective shows and also has us kind of trying to figure what qualifies as a detective show (we don't quite see eye to eye). Regardless, as children we sure did watch a lot of people getting murdered. We discuss the Columbos, Rockfords, MacMillans and Wives, Banaceks and Cannons of our childhood, the merchandising magic of Kojak and Starsky and Hutch. We also go way, way off track, with discussions about Jamie Farr and Three Stooges, I'm sorry. Episode 20 will hopefully have you asking "Just one more thing"
The (very rare) LJN Magnum PI set Jason owns. The 90s FX commerical about Cannon that Brian loves. Simon and Simon walkie talkies as discussed in our show. 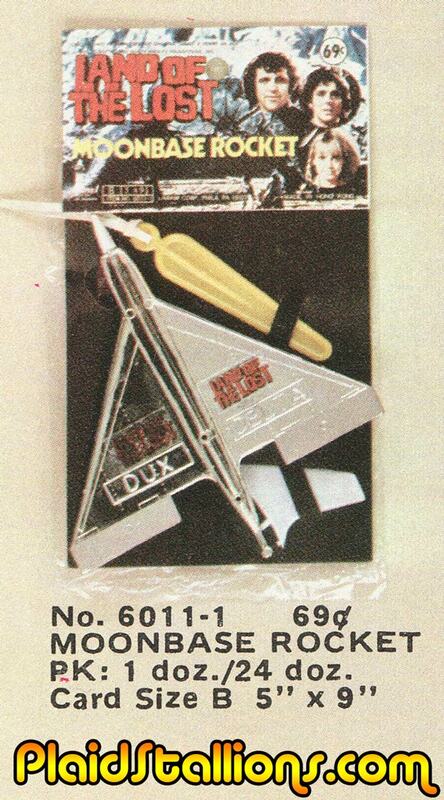 Kojak got not only an action figure but a freaking playset? Yet, I got no Sleestak figures as a child, totally fair. 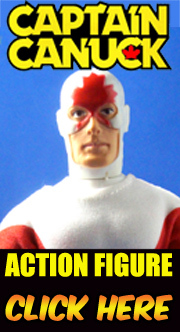 The Police Woman figures were actually repackaged versions of a British toys called HAVOK. Quincy takes on Punk Rock. 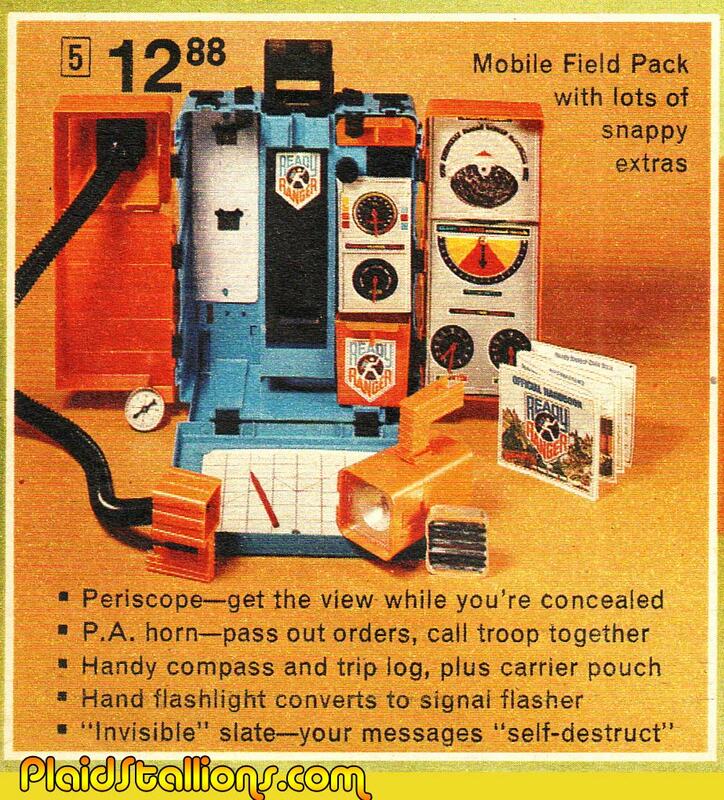 I never had the Aurora Ready Ranger as a kid, so when I first blogged about it here I assumed many of it's features were largely disappointing. Ladies, please try to avoid Randy's powerful gaze at all cost and whatever you do, DO NOT accept an invitation back to his trailer to see his taxidermy, no matter how appealing that sounds, IT'S A TRAP! 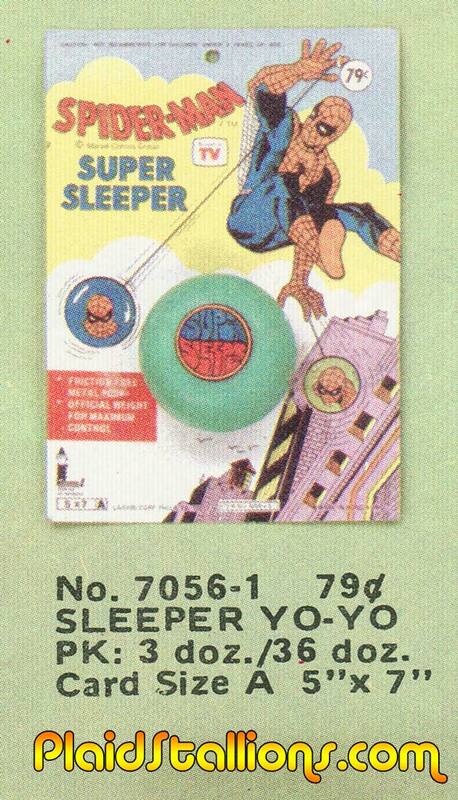 It's not well known but Kraven the Hunter was easily distracted by Spider-Man's ability to "walk the dog" making it easy for our hero to win the day..
Another piece of Close Encounters merchandise I had no idea about. I love the tasteful Charlies Angels portrait. I've posted this photo on the MegoMuseum before but it needs to be put here because it's awesome. 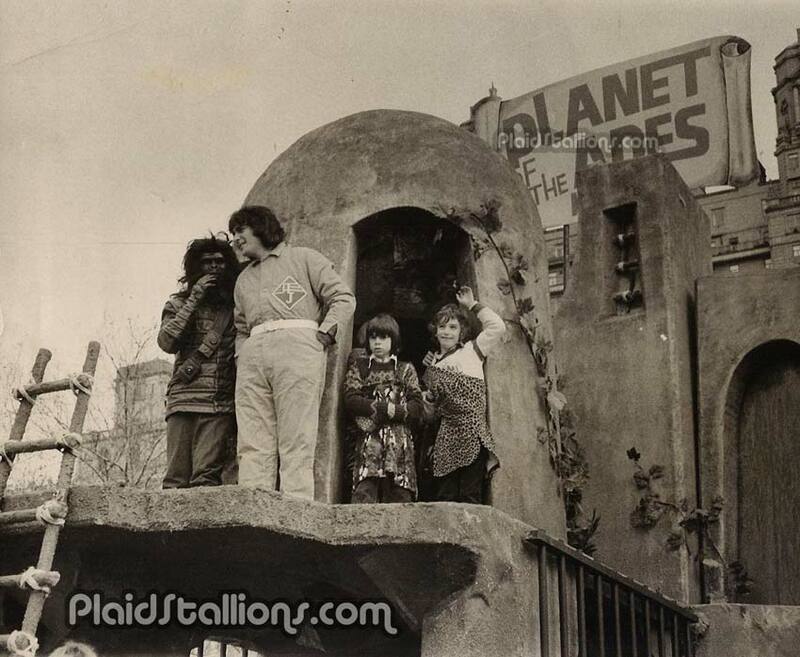 Courtesy of Ken Abrams, I present Mego CEO dressed as Action Jackson atop the Mego Planet of the Apes parade float. The gentleman in the Ape costume is VP of Mego R&D Neal Kublan and the "human captive" children are likely Neal's son Chris and Marty's son Ken. So great! Please send me your mall appearance shots! 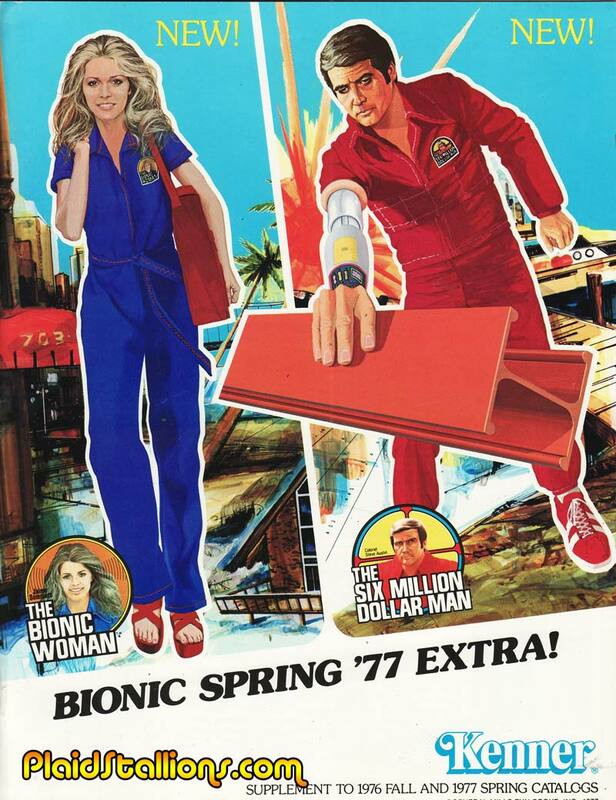 In the Spring of 1977 Kenner issued this supplemental catalog to retailers to showcase the innovations in their (then) biggest hit toy lines, the Six Million Dollar Man and the Bionic Woman. Bionic fever would wane the following year but this was truly a golden time from Bionic fans. Temp agencies are sometimes not the right way to go. 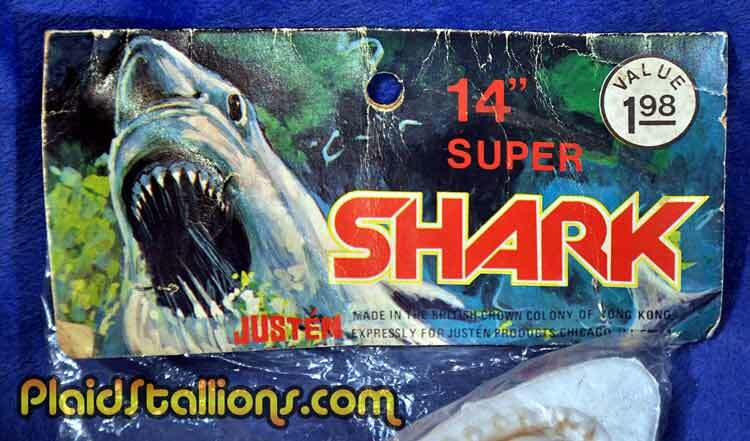 The one window of opportunity of a blockbuster like Jaws is you can't copyright a Shark! 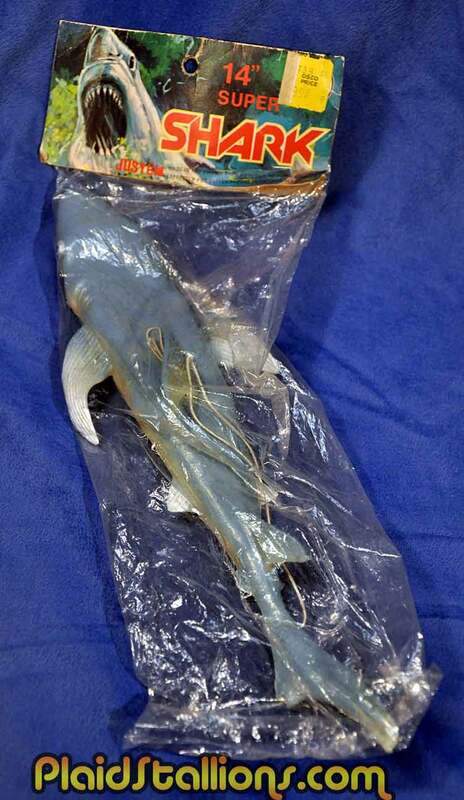 Every rack toy maker (like Justen here) cranked out a Great White for years and made a ton of legitimate money as a result. The sweater suggests "I have a sensitive side" but the shirtlessness boldly states "but don't expect me to cry or some crap". Another colouring book I found rummaging through Planet of the Stuff a couple of weeks ago. 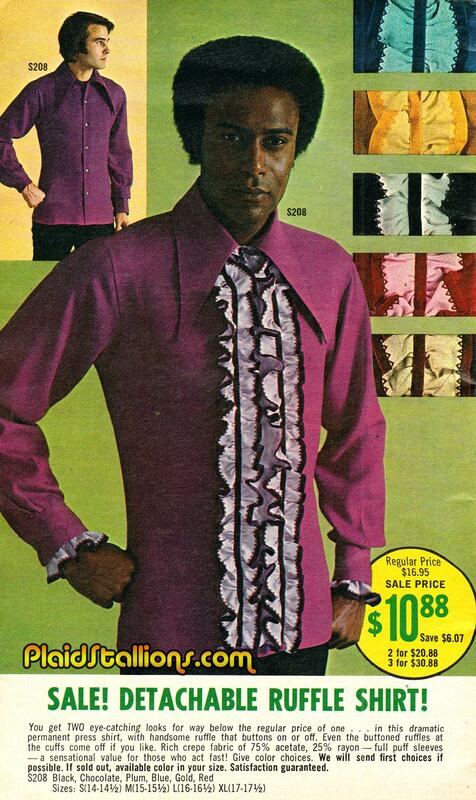 Like a lot of 70s kids, I non-ironically stood in a mirror going "Ayyyyy!" and begged my parents for a leather jacket. 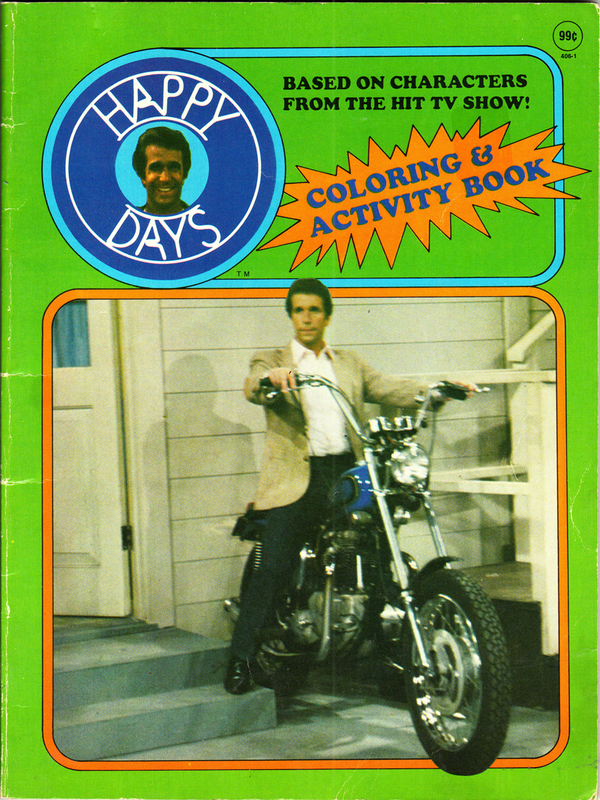 I loved Happy Days, had a Mego Fonize doll and even bought the (lame) Gold Key comic, so it seemed fitting that this would be a fun colouring book to review here. However all that positive energy leaked out when I realized this book was from 1983, a time when Fonzie was a 35 year old shadow of himself and most of the interesting cast members were long since gone, paving way for a big pile of who gives a crap. As far as I can tell, this toy never saw release. 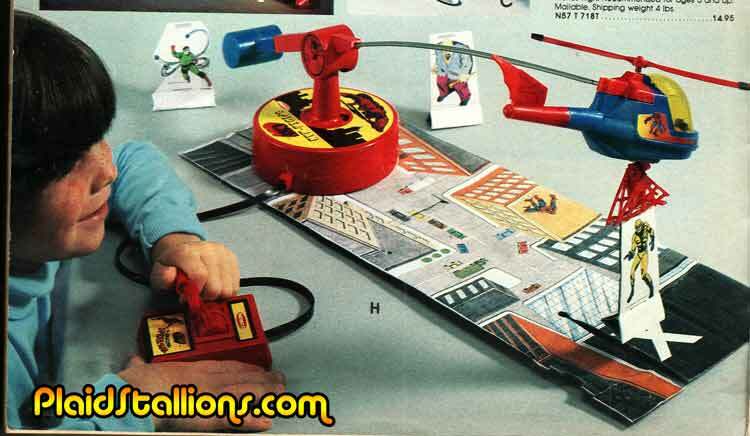 It was offered by a division of Mattel known as Concept 2000 and it gave kids the ability to talk like a cyclon when placed upon their heads. 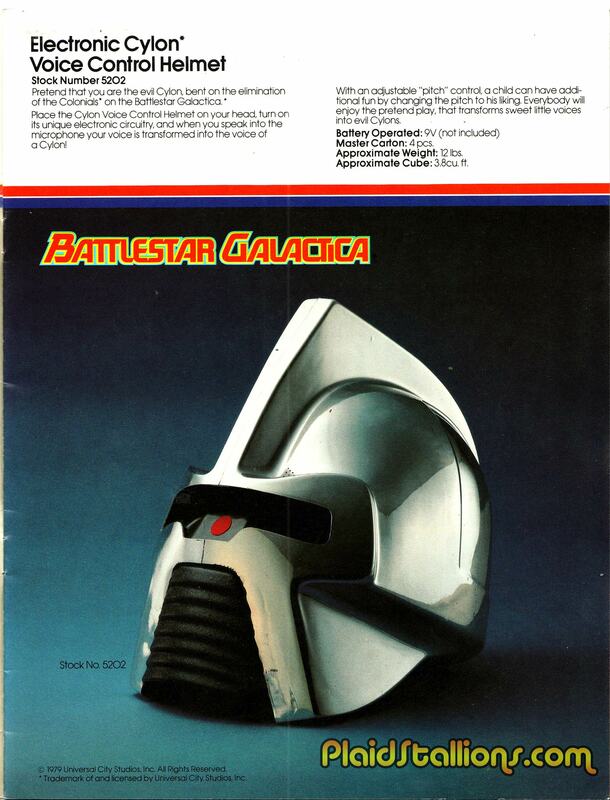 I'm a pretty casual BSG fan but the fact that this didn't get made kind of makes me a little mad.